Watching the weather forecast this week has been a tense affair; all week a possible gap in the seemingly endless frontal systems promised a possible flying opportunity on Saturday. 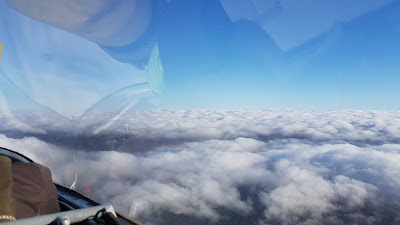 Normally the timing of such gaps tends to move but not this week so Saturday dawned with mostly 8/8ths cloud cover but at least high enough to fly. 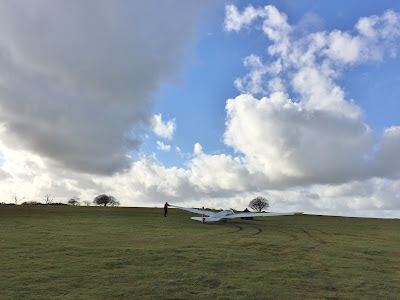 The wind was 12-15 knots westerly at runway level, stronger at altitude of course but flyable. 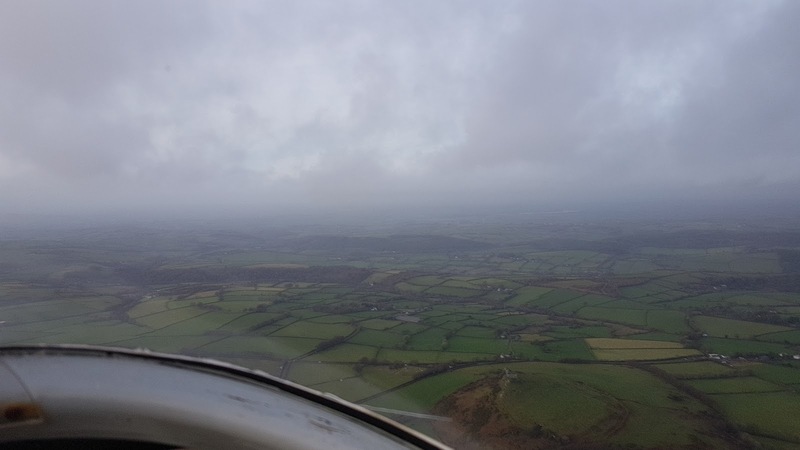 An uninspiring sky but flyable. A K13 was got ready early to take advantage of the conditions. The K8s were left in the hangar, it was possibly a bit windy for them and as there was only a small (but beautifully formed) team the K13 would have enough capacity for our needs. First up was Scratch who completed 2 good circuits with Instructor Rick Wiles to maintain his recency. 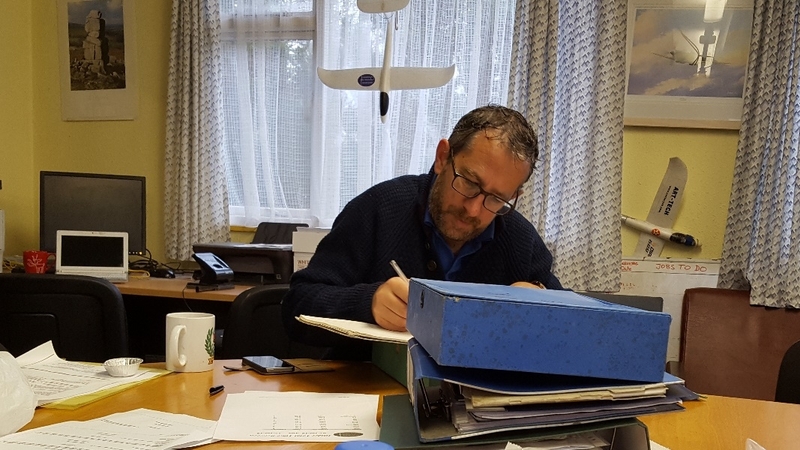 We then welcomed visitor Ben Followell who was attending for a One Day Course. 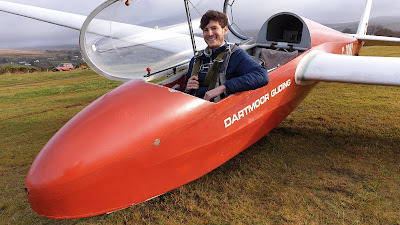 Ben was a solo glider pilot some 7 years ago when he was part of the Cadet Scheme at another airfield. 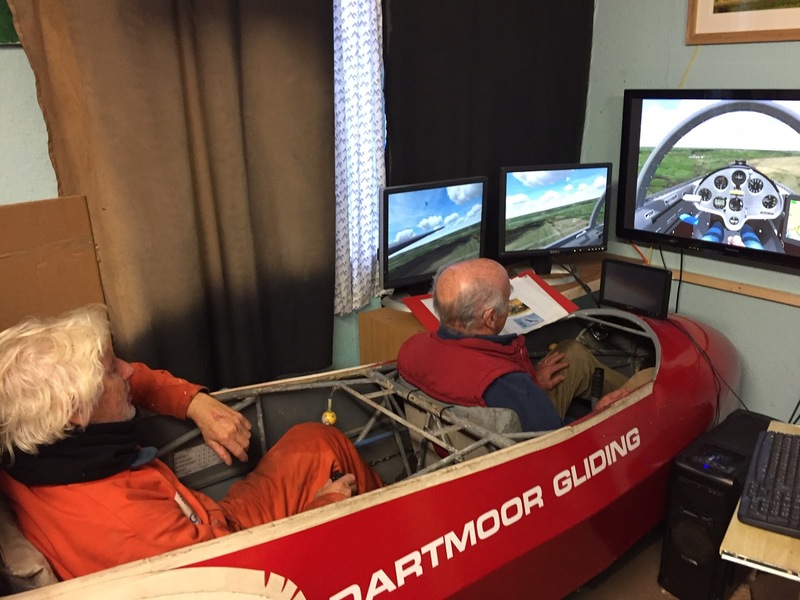 After a couple of familiarisation flights with me he spent the rest of his course with Rick. 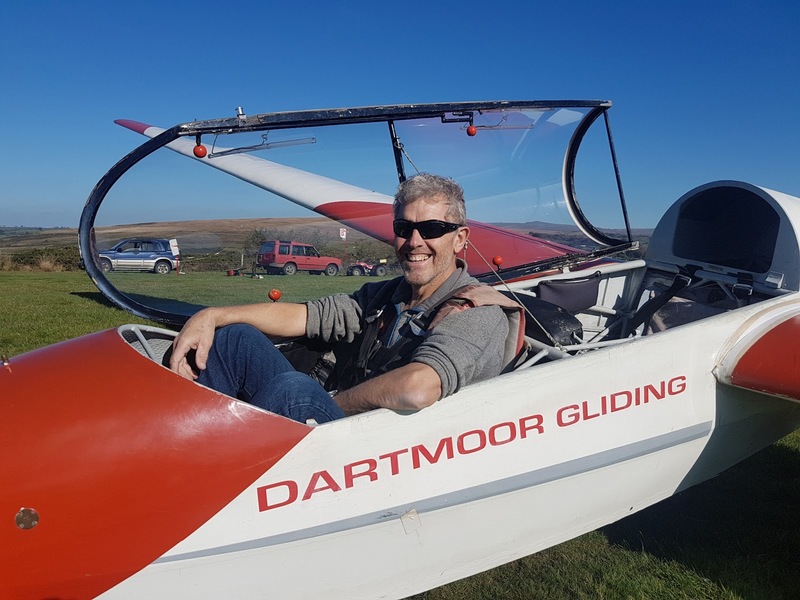 By the end of the day he had flown his first ever winch launch and reacquainted himself with the pleasures of landing the aircraft. Well done Ben. Everyone who wanted to fly did. 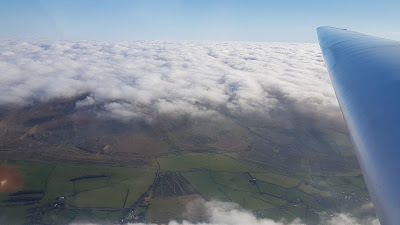 By about 3pm the formation of moisture on the aircraft warned of canopy misting problems to come so the glider was retrned to the hangar and put away after a thorough wash.
looking towards Cornwall from cludbase. Not an epic day but it was good to fly once more. 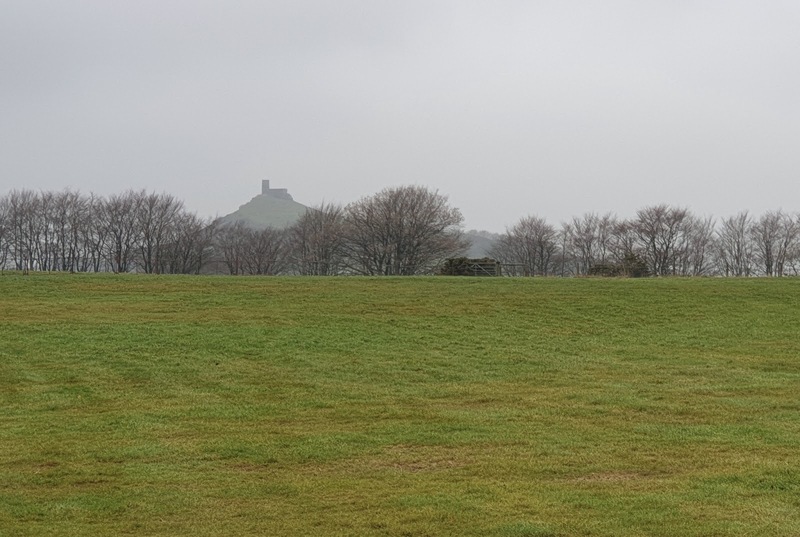 Something strange was seen over Brentor Today. 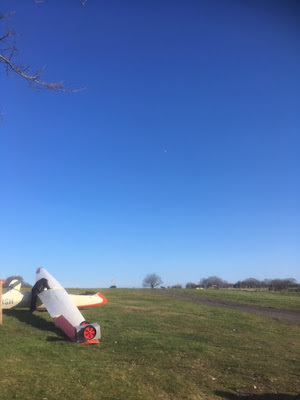 Yes, for a short time it was sunny so we actually got a K13 out of the hangar and flew. If you believe the old wives tale, were we doing the right thing? 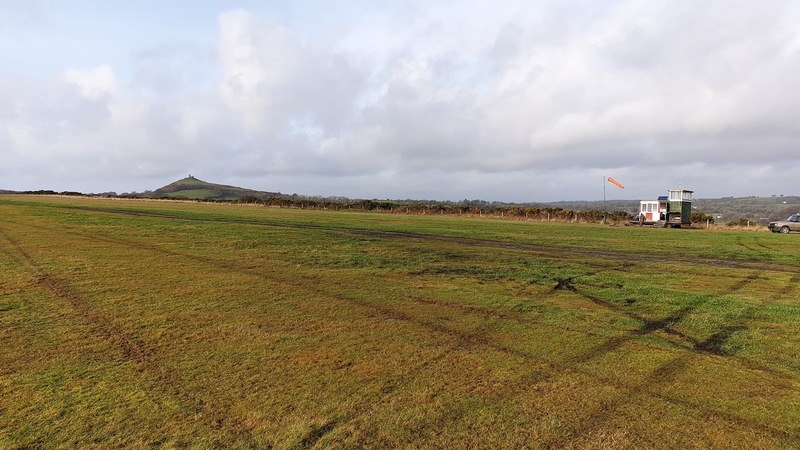 With a small crew gathering and if the weather forecast was going to be right giving a window of opportunity up to about midday it was action stations to get the airfield ready. We decided that it would be one flight each so that everybody would get a chance to fly. First flight was at 10:12 with Mike Bennett and myself. The rain could already been seen approaching from the west It was already raining in Cornwall. 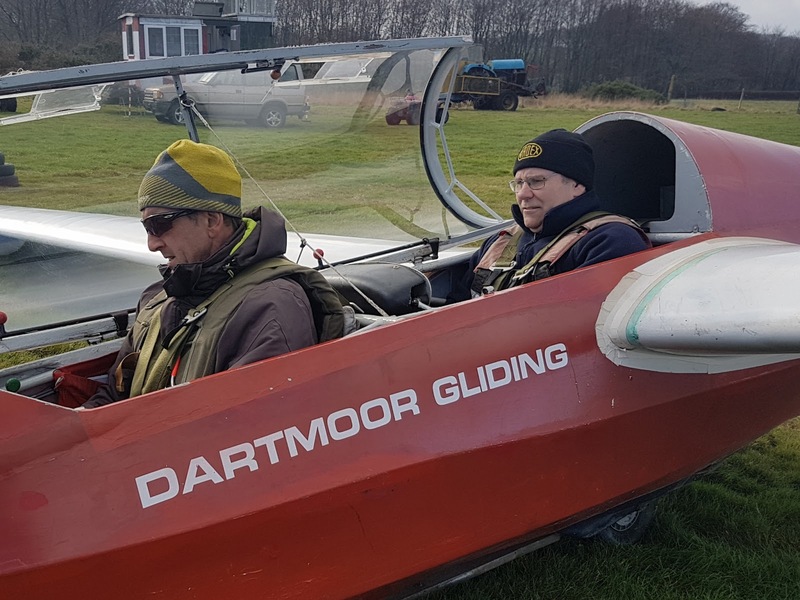 Three more flights were achieved with Andy Davey, Martin Cropper and Steve Fletcher. With the rain arriving it was now a quick dash to put the glider away (yes Colin it was dried off) and clear the airfield. 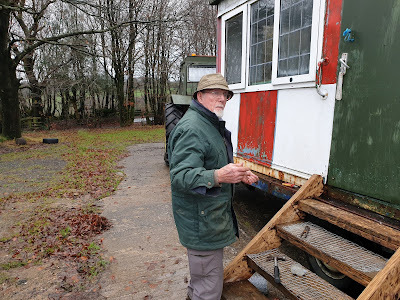 Back in the clubhouse it was time for teas and coffees to wash down the mince pirs supplied by Andy. The chairman set about updating the log books whilst we had our drinks. Only a few flights, but it was good to actually fly for once. 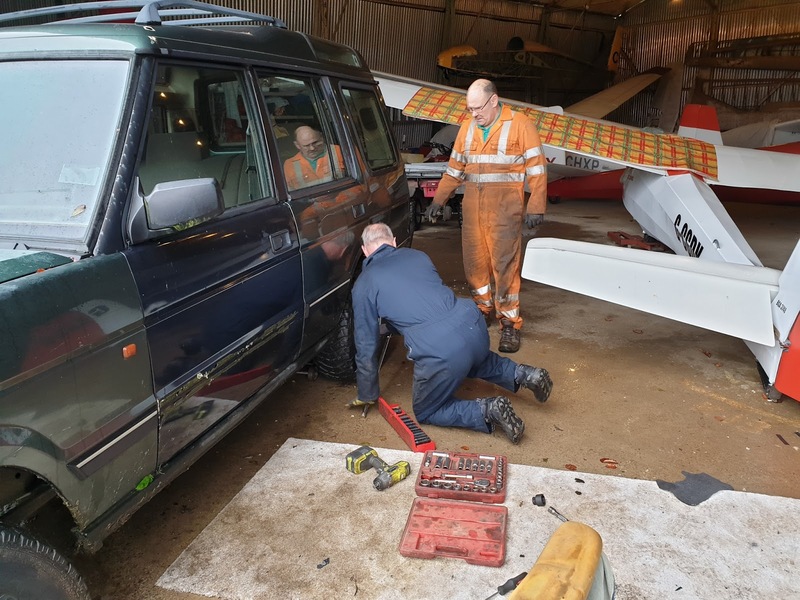 Thank you to Richard for winching and everone else for the teamwork in running the airfield. 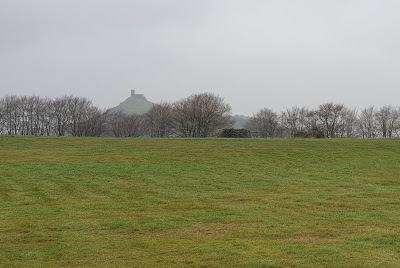 The weather has unfortunately settled into a winter pattern with low cloud interspersed with pulses of rain and high winds. So the last couple of weekends it just has not been possible to fly. Does that me that the airfield has been quiet and deserted? Not a bit of it. The members have been getting on with their (mostly self appointed) tasks. The sprucing up of the launch hut (mostly masterminded by Heather and Barry) has seen major improvements being made. The interior has had a completed paint job and the flooring replaced. It is looking much nicer. 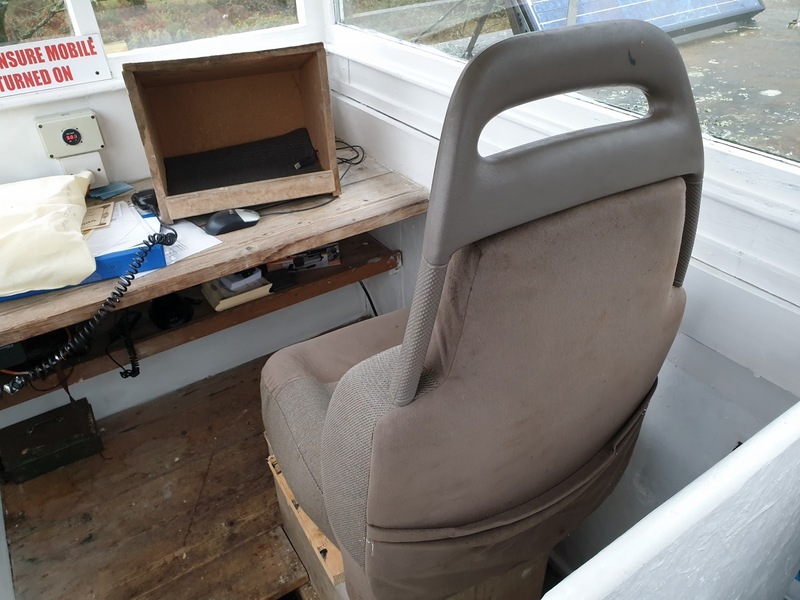 Scratch was drafted in to replace the log keepers seat with one he rescued from the Green Landrover. Outside, the steps have been refurbished and now sport some new non-slip treads. The exterior has been partly sanded ready for a new cost of paint. This will need to be a group effort as the paint of choice is a two pack paint which will harden very quickly once the catalyst is mixed. And the colour - Olive Green. Rick and Scratch have been working on the vehicles. The Green Landrover has been stripped of any useful parts and then sent to the scrap yard. The bus has been started. A decision on it's future; new launch hut or sale?? will be made soon. The red tractor has had a leak in the cooling system repaired. I am sure I have missed some of what they did but you get the idea. Mike Bennett has been a one man whirl wind. The area behind the trailer park and clubhouse has been tidied including cutting back all the stray foliage. The defunct storage shed has been emptied and is now ready for disassembly. 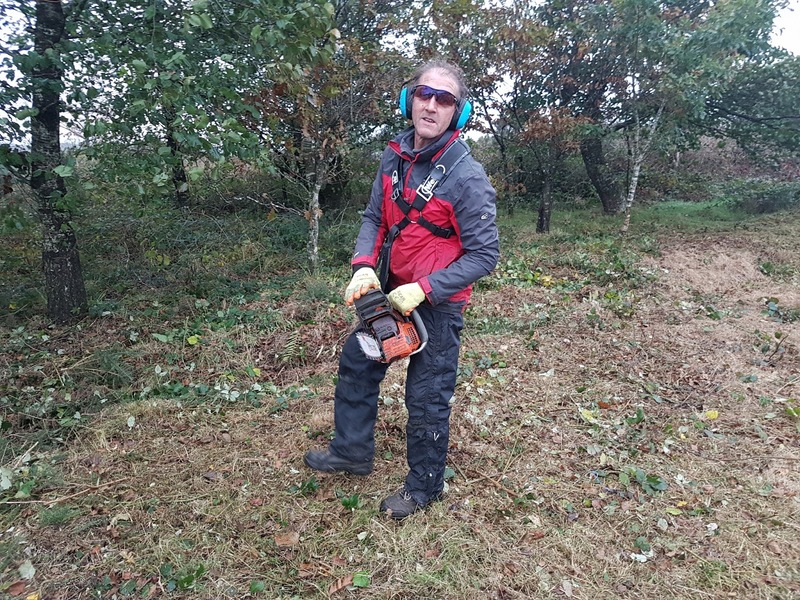 If that wasn't enough Mike has also been cutting up lots of wood for the burner to keep the clubhouse warm. Where does he get all that energy? In the clubhouse the simulator has seen quite a bit of upgrading. The last few months has seen it upgrading to sport 6 screens. 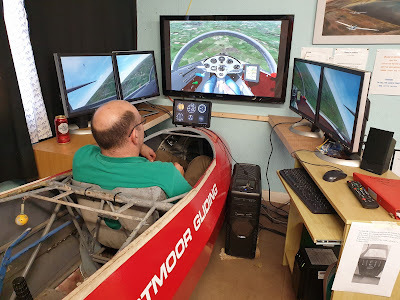 The large central one, 2 side monitors on each side to give a view that now goes from wing tip to wing tip ( great for circuit planning and winch launching ). The sixth screen is a small one in front of the front seat which displays the flight instruments. The software has not been ignored. The simulator now uses Condor 2. As if all that wasn't enough Rick has spent a lot of time at home developing the new local airspace files. Steve working on learning the instructor patter with Rick using the simulator. In the hangar, Zugvogel and K13 HXP have been de-rigged ready for their C of A and ARC. 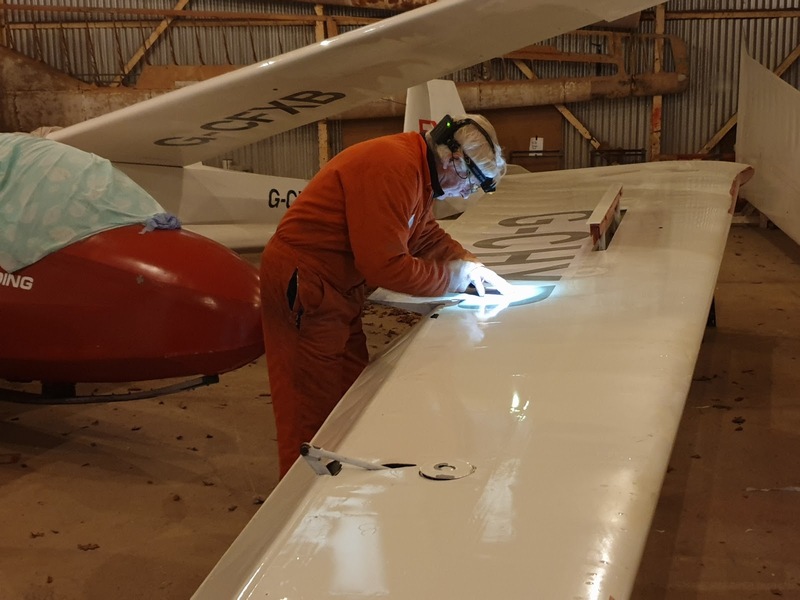 Colin, who now has ARC inspection added to his inspectors ticket, has been to the airfield most days to move this project on. 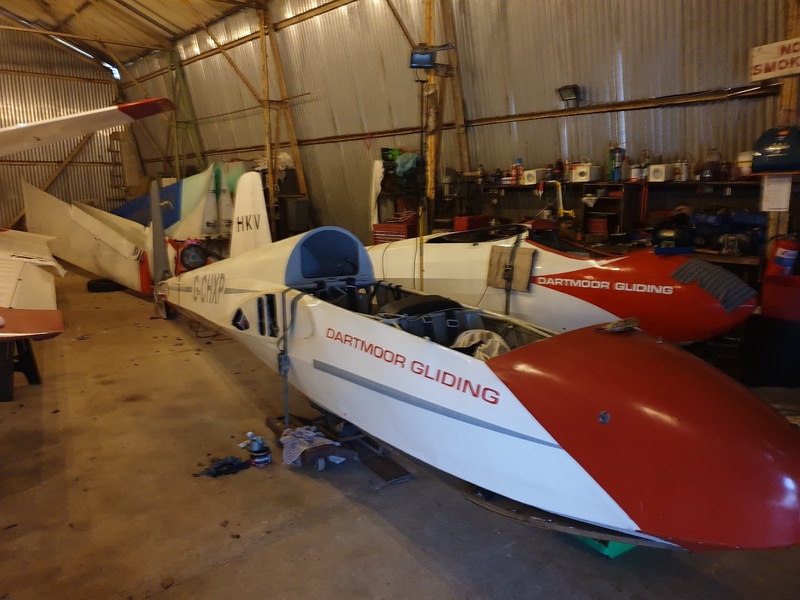 The K13 is not really due yet but we have decided to move it to the winter months when it's absence from the fleet is not as difficult to manage. Hoping for some flying weather soon. I would like to say that today we emulated our Sunday flyers and went soaring up to great heights straight off the launch. I would LIKE to say that but cannot. 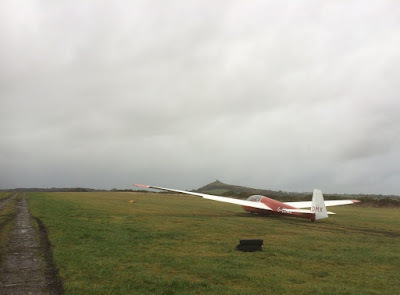 We were blessed instead with low cloud and drizzle which kept the gliders in the hangar once more. The assembled members just got on with their self appointed tasks. Heather and Barry continued with the refurbishment of the interior of the launch hut which is now looking much smarter. Rick and Scratch were getting oily once again working on the bus engine with a side order of fixing the red tractor's colling system. Personally I had a go at smartening up the rear seat instrument panel in DMX. This came about after Rick sent me a flying picture taken during his wave flight last Saturday. A kinder person than me might a referred to it as "Shabby Chic" but OMG I just couldn't leave it like that. 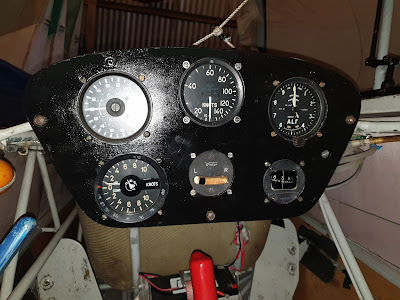 So instruments out and, a quick spray and rebuild later, it looks a bit more presentable. Not perfect but better. Hoping for flying weather on Saturdays please. Well today started with 6 members and a couple of visitors from Northill on site by 845am. 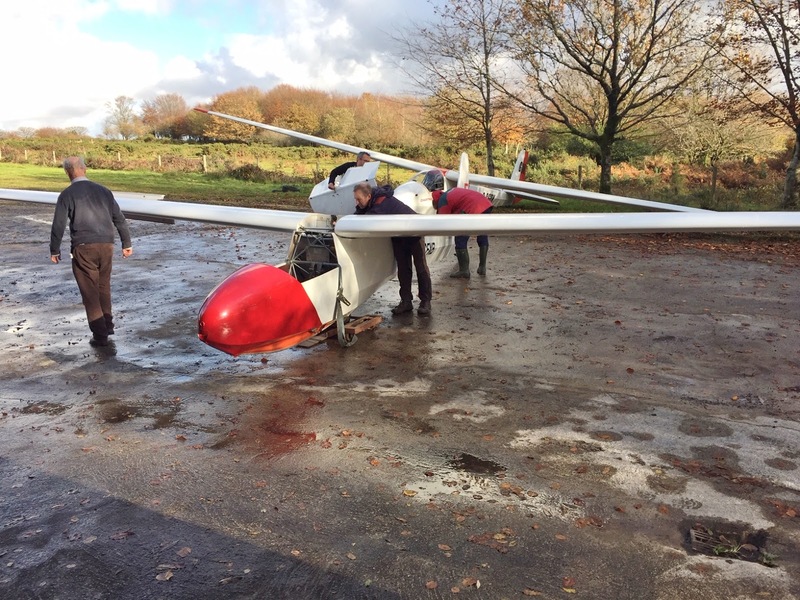 Then thankfully the club members continued to arrive giving us all the help we needed to open the airfield. The forecast was for a lively easterly wind gusting at various points to 22 knots at low level. 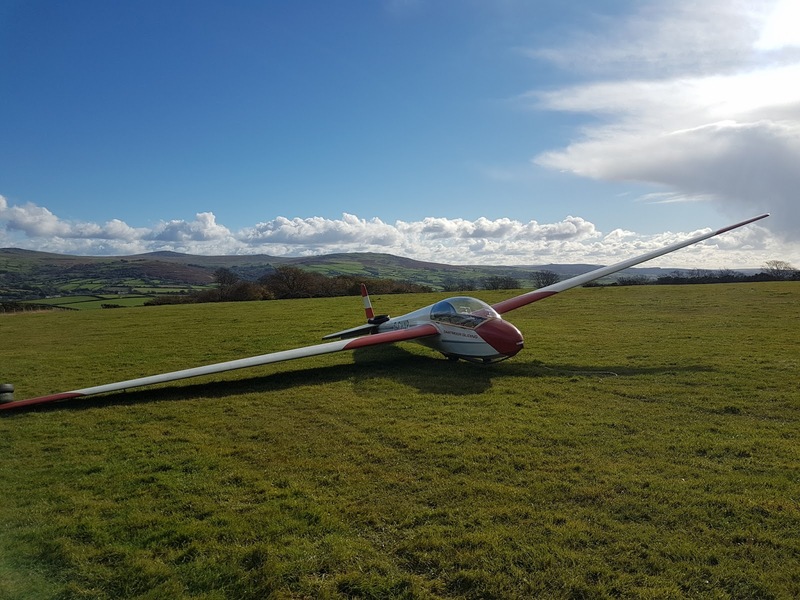 Although not ideal conditions that lend themselves to learning the sport of gliding for the inexperienced ,for the more experienced pilots and instructors that were all hoping for wave flying in some form it looked promising. 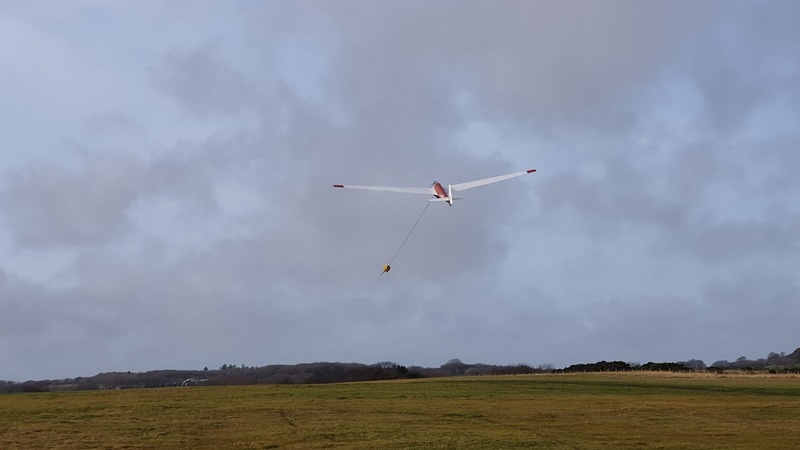 The weather check flight was done by cfi Mark Courtney and Roger Appleboom , launch height of 1800ft with wave found in the immediate area over the winch. Roger Appleboom (k6cr)took this beautiful photo looking south towards Plymouth sound. Thanks must go to the solid team who chose to help out and not fly , Alan,Leith, Colin and team Northill were a massive help, we really are grateful. Unfortunately the last two flights of the day failed to connect to the wave , we assume the bars had shifted a little. All aircraft put to bed and fence etc sorted by 4:20pm. With high pressure in charge and the wind flowing from the east there was a good chance of wave today. The day started with low overcast with drizzle on the coast but over the airfield the wave system was obvious. The wind was certainly easterly but stronger than forecast, so a day to fly the K13's and leave the K8's in the hangar. 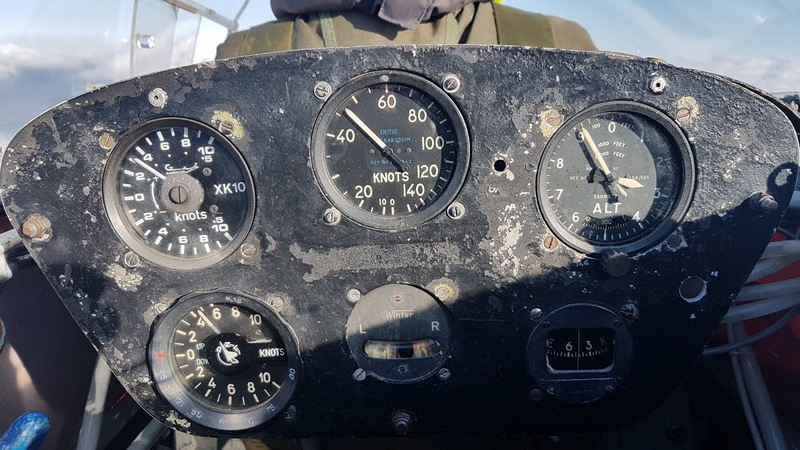 The first wave bar was a long way up wind of the airfield, the second was towards the west end so we would probably be launching into sink with the need to immediately fly downwind to the east end to either connect with the wave and rotor or land. The first flight was Mike Bennett with Rick. and that is exactly what they did. After a turbulent launch they flew downwind and used the rotor to connect with the secondary wave bar. They then used this to climb to 3600 feet giving them enough height to move forward to the primary wave bar almost overhead the leading edge of the moor. They returned 37 minutes later big smiles on their faces. Looking east from the primary wave bar. I was due to fly the second flight in the other K13 but I made a tactical error. I decided that as we were a little short handed, I would spend 10 minutes or so to help rig a glider before flying. This took much longer than usual due to a stuck pin. On returning to the K13 it was obvious that the weather had changed again. The wind was even stronger, with the gusts almost making standing difficult. 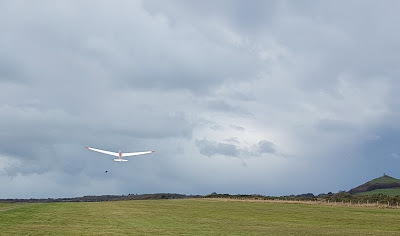 This lead to us taking the gliders back to the hangar for safe keeping while we waited for conditions to settle down. 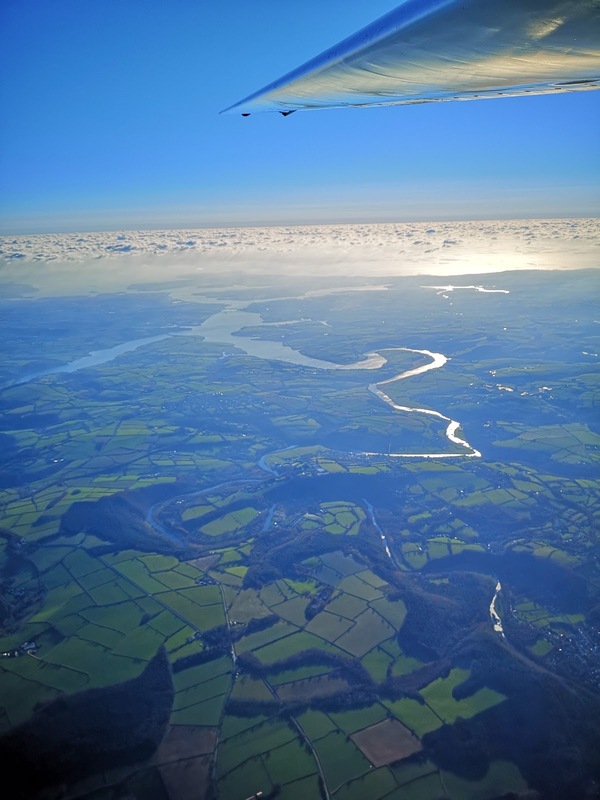 We were patient but the wind just did not settle so by late afternoon we abandoned any chance of further flying. What a shame. As this was the first easterly day I expect that the conditions will improve over the next few days. 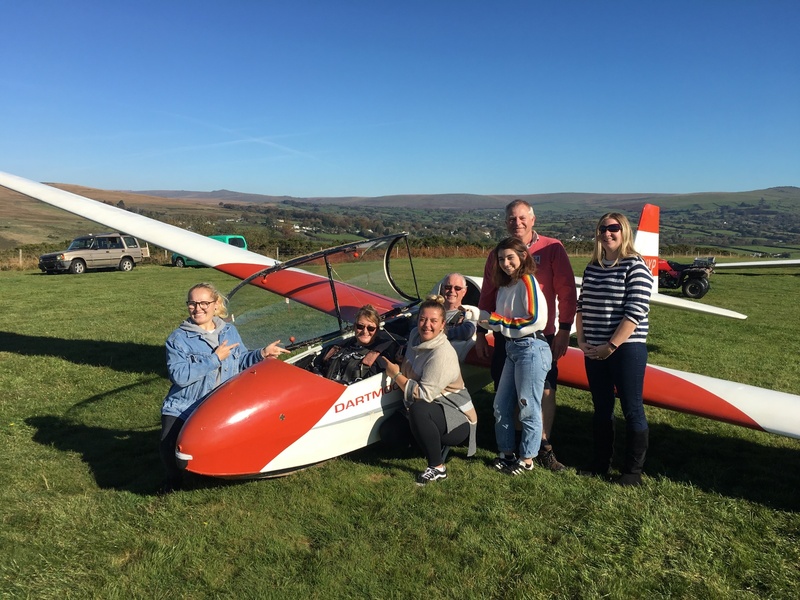 A small team gathered at the club on Sunday, the forecast was for South westerly winds and showers. 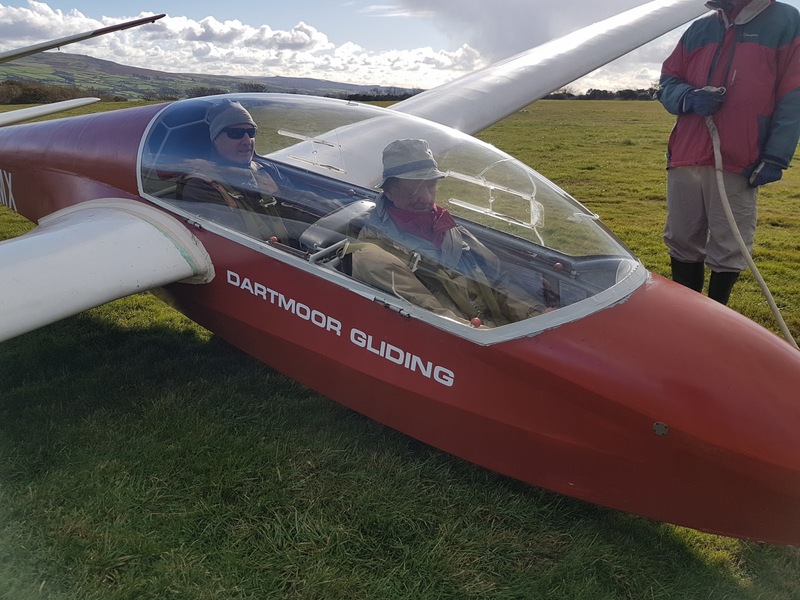 The field was set up and first to fly was trial flight visitor Janeta Clarke who visited with her experienced ex forces helicopter pilot husband. After 11 minutes aloft keeping ahead of the approaching showers we landed back at the field and then the showers arrived. John O’Connell and I waited in the K13 But the weather worsened and with the wind moving South east ,gusting and with a horizontal wind sock I decided to call an end to the flying. Next task was to rig the second K8 so we will now have two online shortly. 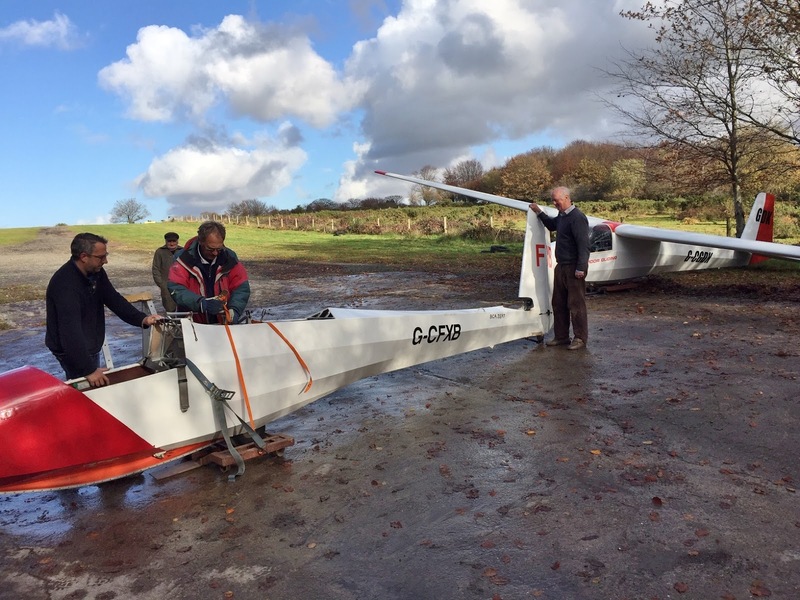 Thanks to our ever optimistic members that turned up today to put a lot of effort in for what was a short flying day and for rigging the K8. With a frontal system on the way the weather started off badly and just got worse. 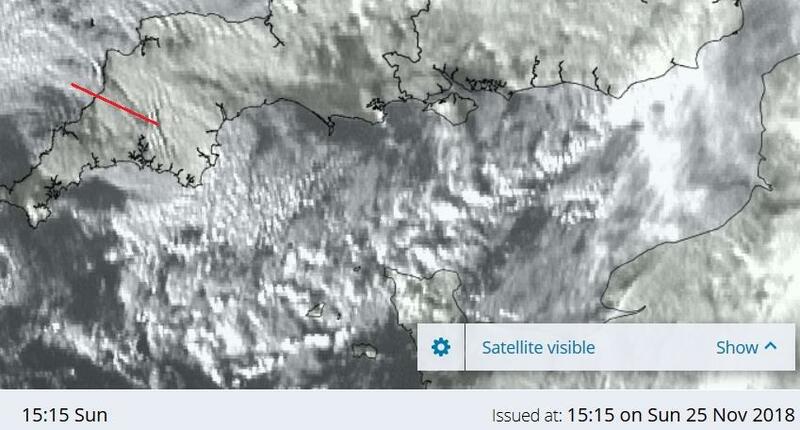 Early on saw low cloud and near gale force, southerly winds. As the day progressed the cloud lowered even further and turned to drizzle which became heavy rain by the end of the day. So another non flying day. Several tasks were undertaken. 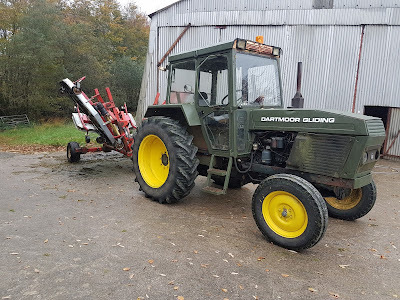 The tractors were brought down to the hangar apron for some TLC and the mower was pressure washed in preparation for the winter. Mike spent his day tidy up all the gorse, brambles and long grass on the western side of the trailer park as part of the drive to tidy up. The simulator had parts of the trim mechanism replaced. 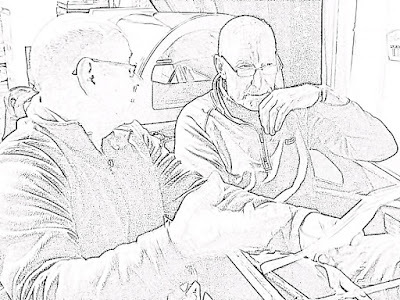 Later David Archer and I spent some time working through Approach Control. We will be offering lectures as required throughout the winter. 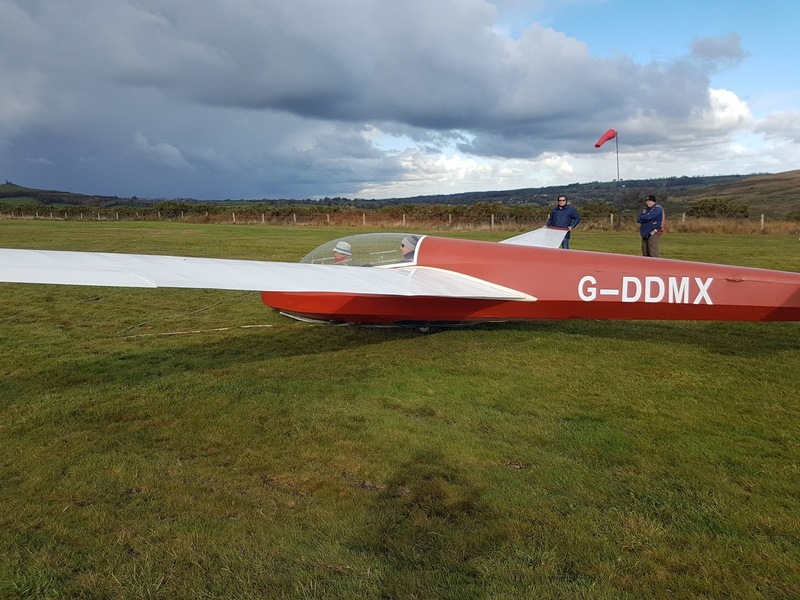 Later in the day the committee met for their meeting during which it was decided to purchase Bob's K8 which has been on loan to us for some time. The members will now have a choice of 2 K8's to fly. Due to work commitments I arrived at the airfield after lunch where the team had everything prepared ready for the flying to commence. 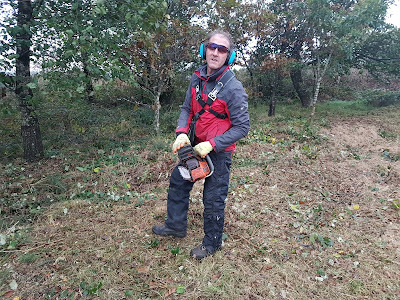 The RASP was not looking good for the day but we got on with the flying programme. 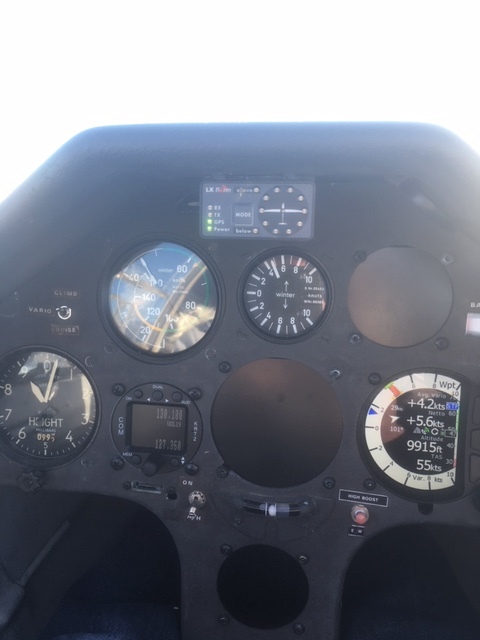 First up, two flights with Robin to work towards getting him current again. Next up was John Smith. John and I sat in the K13 waiting for a break in the clouds that had moved in from the South East. 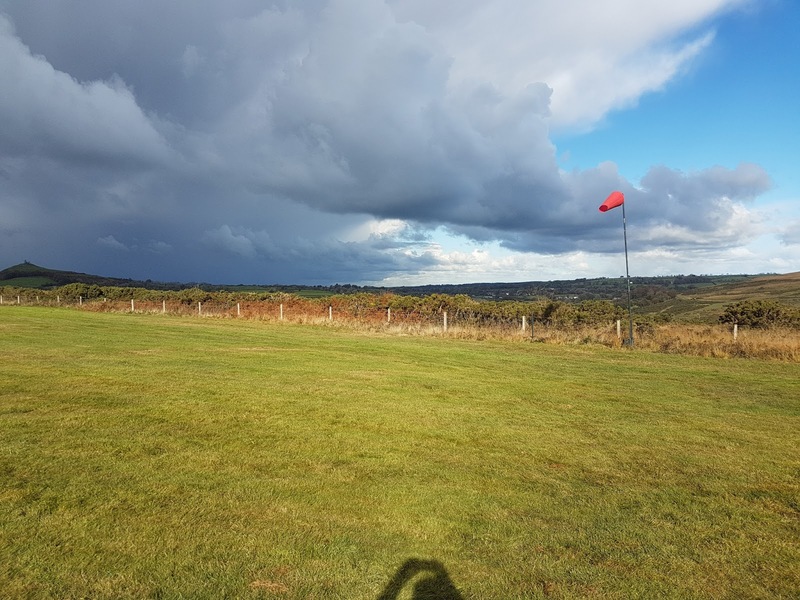 The break never came and with a cloud base at around 500 -600 feet I called it a day and we moved to the warmth of the club house where new member John O’Connell tried his hand on the simulator under the watchful eye of Colin Boyd. John trying out the simulator while Colin looks on from the back seat. Thanks to all for the preparation. What a difference a week makes. 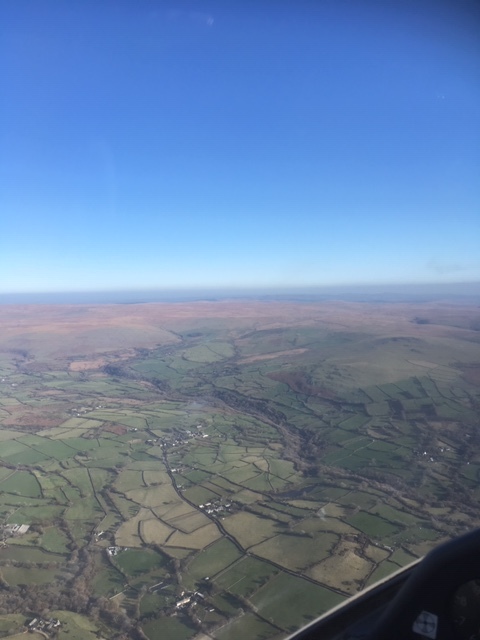 Last week we were flying in tee shirts and shorts. 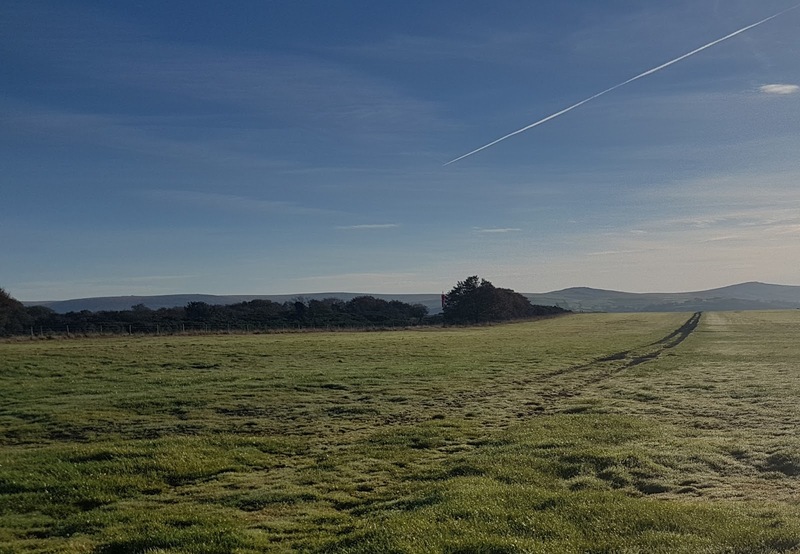 Today, even though initially we had a clear sky, the temperature was a decidedly chilly 7C. 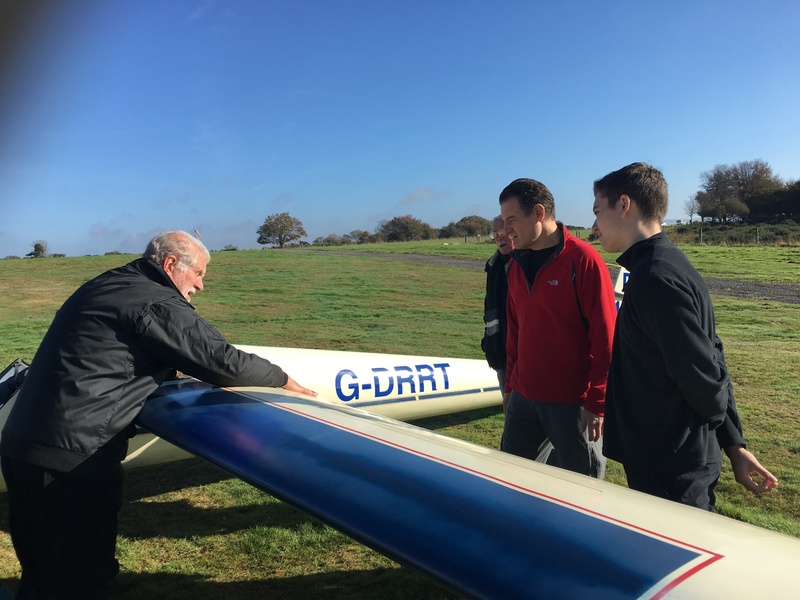 After allowing for the wind chill from the 15 knot northerly this was close to freezing and the assembled members were wrapped up in every layer they had brought with them. Personally I was wishing I had brought my Arctic cold weather suit; a lesson learned. The northerly wind was strong and gusty straight across the runway, definitely out of limits for flying visitors which were reluctantly canceled for the day. The club was going to fly though so both K13's were readied and taken to the east end launchpoint. Instructors Rick and Mike proceeded to fly with all the memmbers who wished to fly including new member John O'Connell who is keen to experience glider flying in all it's facets.. Very quickly the were showers all over the local area but luckily these seemed to go around the airfield. Rick seemed to be well tuned in to the conditions. 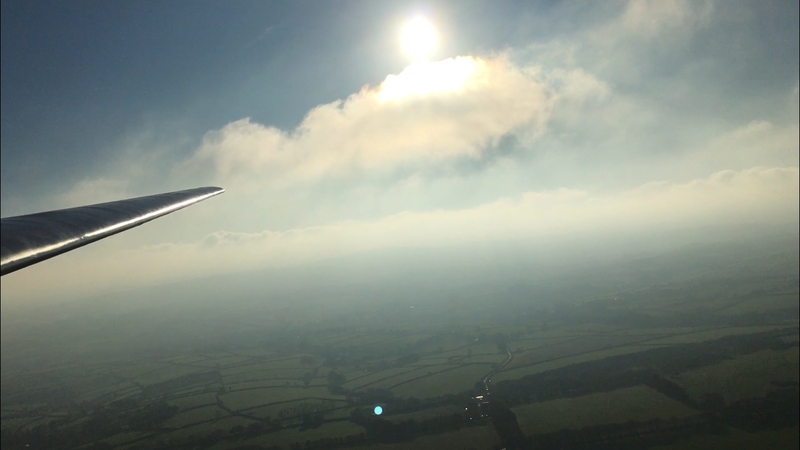 Twice he managed to find a thermal to whisk him rapidly to the 2000 ft cloudbase before being blown too far downwind. 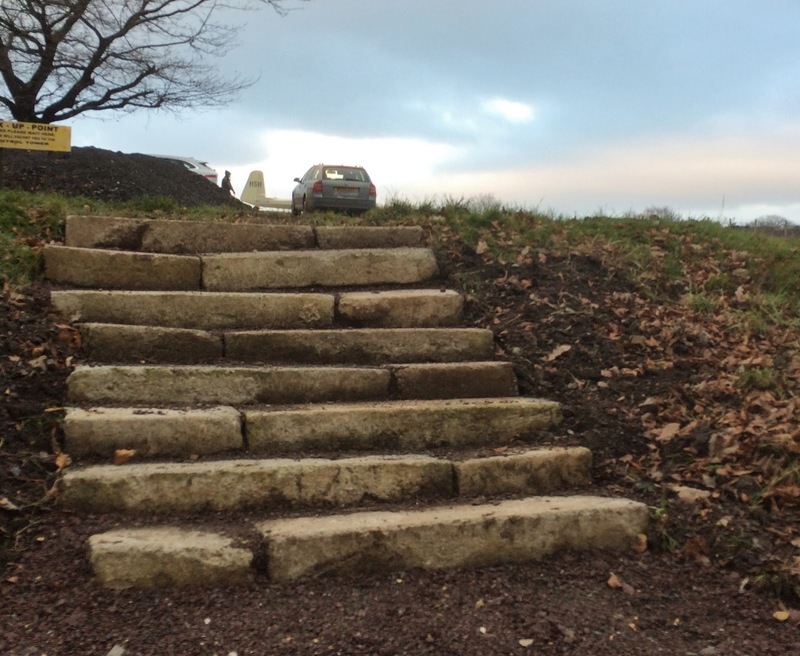 The first of these was a 19 minute effort with John Smith followed by 17 minutes with David Archer. There was also some lift to be had from the north ridge but only relatively low down. The gusty conditions sensibly prevented too much exporation of this. MOst landings were on the stub runway. Around 3pm we had had enough of the cold and, as all those who wanted to fly had done so, decided to return the gliders to the hangar. We made the best of a difficult day. 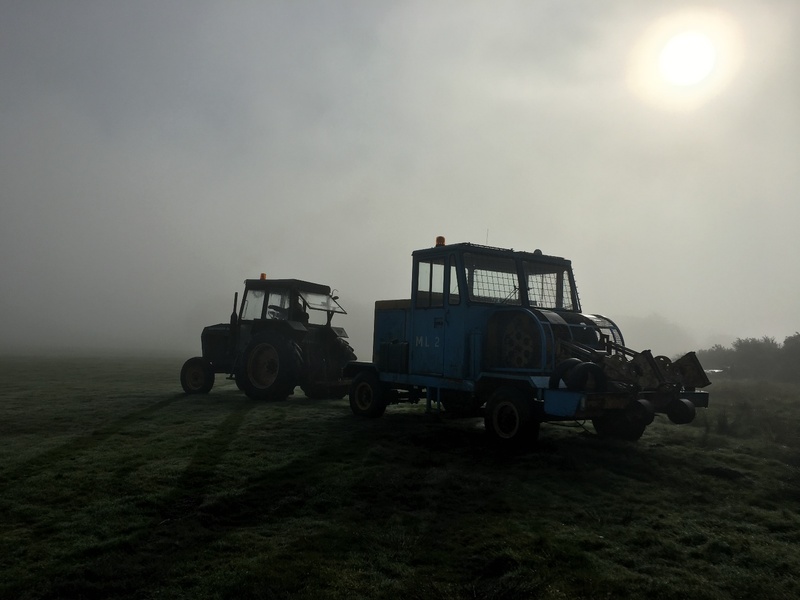 A small but beautifully formed Wednesday crew turned up to be met by thick fog and NNW fresh breeze across the runway. After the usual deliberations and a cup of tea we set the field up and waited. 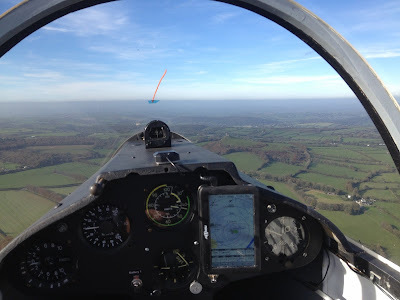 I decided to rig my Cirrus and as the fog dispersed and the wind moderated to about 10 to 15 knots I decided to launch. Given a rasp forecast of no thermic activity and not a cumulus cloud to be seen no one else felt the desire to rig. Driving to the airfield, the weather was bright with some early morning mist patches which would soon burn off. 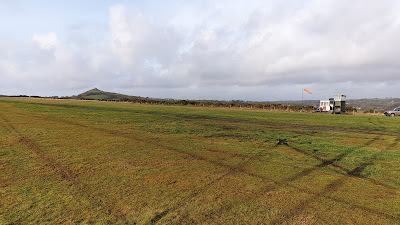 After a cup of tea and coffee, the early arrivees set about getting the airfield ready. The first job was to sort a winch out. With only one cable available on the Gus it was decided to use ML2. A quick phone call to Rick to confirm it was on line, revealed that the brakes needed adjusting before it could be used. Andy Davey undertook the task and the cables were soon towed out ready for flying. 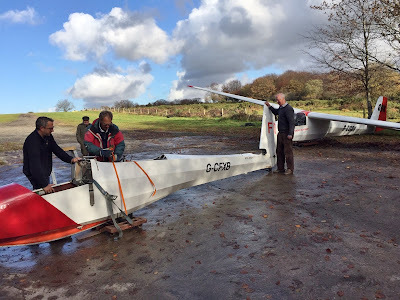 With both K8’s off line, the two K13’s were DI’d and towed to the launch point. Unfortunately by this time the fog had decended and we had to stand down and hopefully wait for the fog to lift. The fog descends for the first time. After about an hour and a half the fog had lifted and we decided to go flying. First up was visitor Joanne Greaves who came with her family and friends. 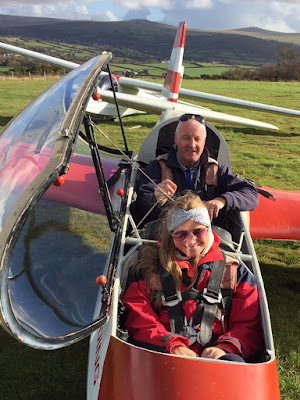 She was a bit of an adrenaline junkie who has previously done a tandem parachute jump. Despite this she did let out a bit of a scream in the first part of the launch. After three short flights she left with a big smile on her face. Next to fly was returning new member John O’Connell who was getting to grips with the primary effects of controls and starting to use all three controls. Also flying with me to maintain currency were Martin Cropper and Colin Boyd. 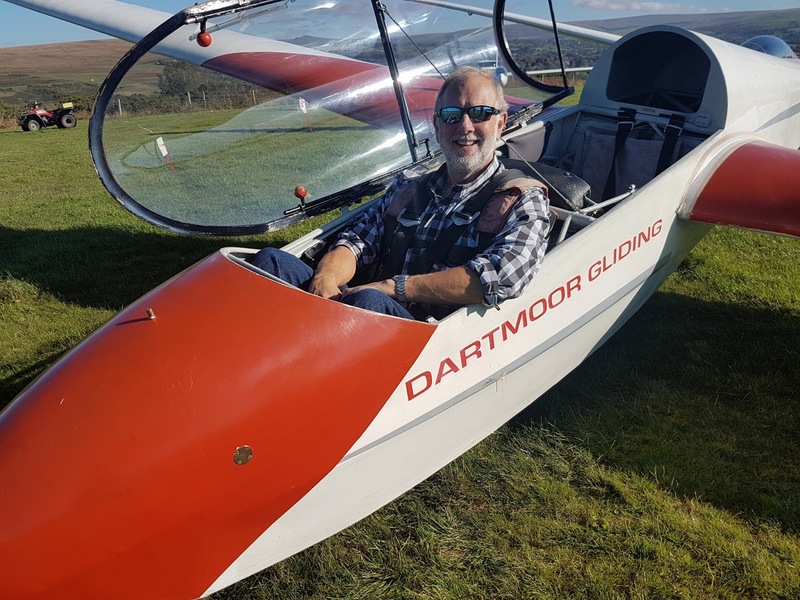 The other solo pilots Roger Applebloom, Ed Borlase and Andy Davey made use of the K13 with no K8 to fly. Leith added to the circuit count in his Dart. We also had a visit from prospective junior member Marcus with his father and grandfather. Marcus spent most of the day helping around the field under the guidance of Colin Boyde. Although he was offered the chance to fly, it was decided to return at a later date after buying a voucher. Marcus and family talking to Leith. The view from K13 late in the day. Thanks go to everybody who looked after our visitor and ran the field especially Alan Holland who winched without flying due to a dose of the flu. Only 18 flights with the late start not bad. 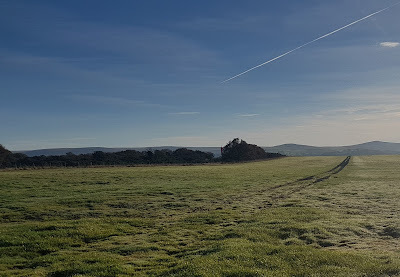 With high pressure very much in charge, today's sky was cloudless from start to finish. What little breeze there was came from the south. The early morning dew was amazing, the grass couldn't have been wetter if it had been hosed down. The launch point was set up at the east end. the winch was set up at the west end just inside the fence line. 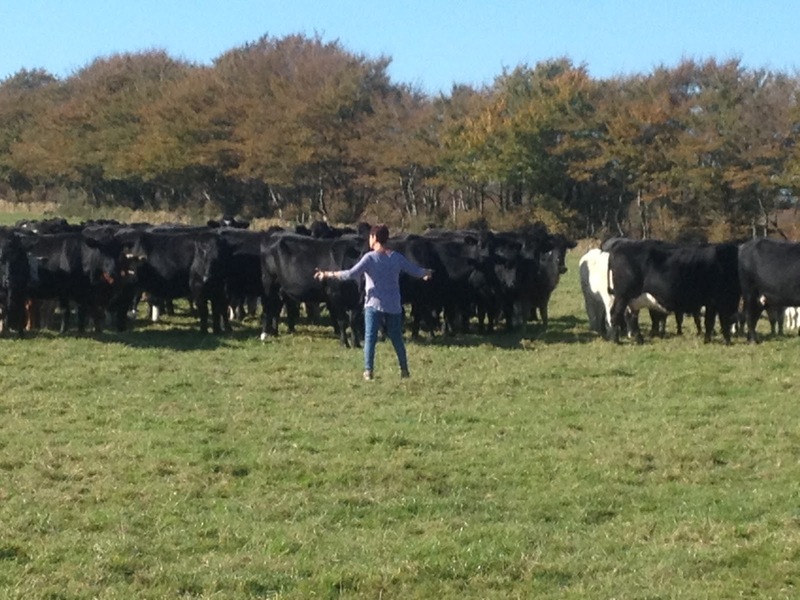 The cattle in the top field prevented the use of the field to extend the cable length. Initially we removed half of the fence to provide more cable break options but the cattle were so intent on getting onto the runway ( our grass must look a lot better than that in the other field ) that we had to replace the fence. 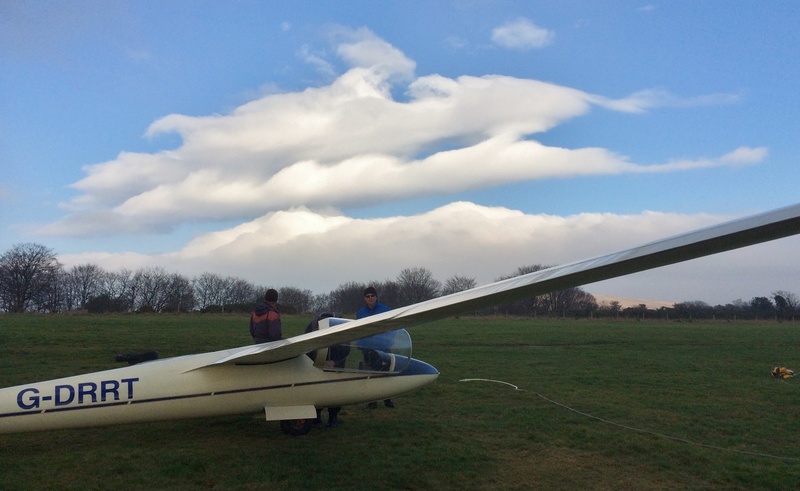 Today's conditions lured out several private gliders with the Open Cirrus, Twin Astir and Barry's SF27 all making an appearance. The day did not live up to the promise of thermals in the blue. 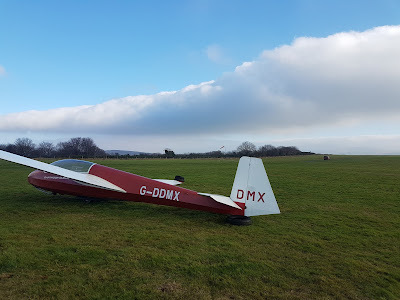 Best flight of the day was a 15 minute effort by me in K13 G-CHXP with a small thermal located overhead Brentor Church enabling a height gain of a whole 150 feet. A least everyone tried. 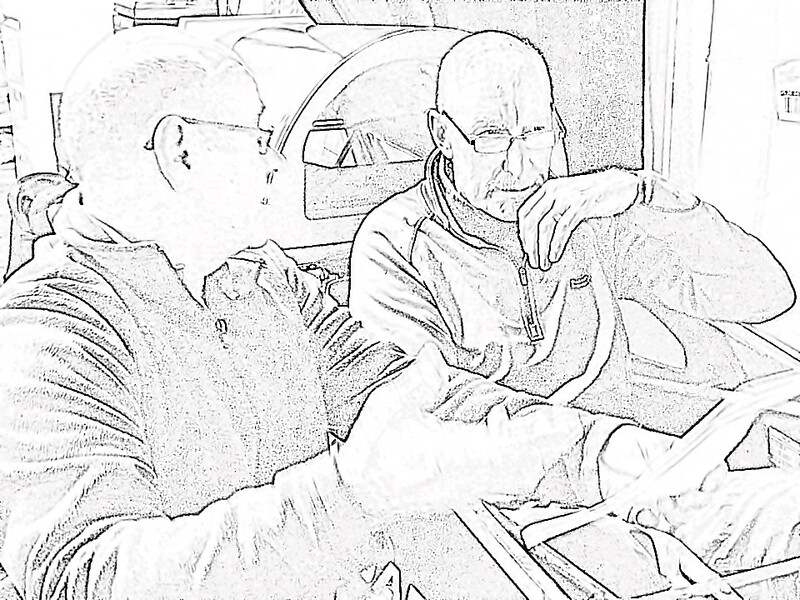 Today we hosted 2 One Day Courses with friends Neville Devonport and Stephen Robinson.